Julian Neuhauser, a VCU English graduate student, has been cataloging VCU Libraries' collection of books published before 1800, greatly enhancing their research value and discoverability. The stacks of books in Julian Neuhauser’s office in James Branch Cabell Library are very old and very rare. There is a tiny book, dating back to 1709, that is bound with tortoise shell. There is an early goatskin-bound copy of “A Dictionary of the English Language,” the original dictionary by Samuel Johnson. And there is a 1723 edition of “Daimonologia, or, A Treatise of Spirits,” an occult text from the personal library of Richmond fantasy author James Branch Cabell, namesake of the James Branch Cabell Library. These rare books have long been available to researchers as part of VCU Libraries’ Special Collections and Archives, but now, thanks to the efforts of Neuhauser, a graduate student in the Department of English in the College of Humanities and Sciences, they are more accessible than ever before. "Seder Tefilah," a small Hebrew book printed in 1709 is bound in tortoise shell. Over the past year, Neuhauser has been cataloging VCU Libraries’ trove of books published before 1800, allowing researchers to not only search by author, title and subject, but also now by a wide variety of material features. For book historians, he said, studying the physical properties of books provides insight into the printing processes and bookselling industry of a period, which opens up new culturally significant literary readings. “Books are artifacts,” he continued. “Yes, they’re stories and, yes, they’re literary items, but they’re also artifacts from a specific time and place. They’re as close as you can get to reaching back to that culture.” Neuhauser said that a book represents “the intellectual labor of the author and the zeitgeist of the time,” but also that books contain evidence of the “physical and social labor” that characterized the material productive capacity of the time. Yes, they’re stories and, yes, they’re literary items, but they’re also artifacts from a specific time and place. Neuhauser’s project, which was a one-year assistantship with VCU Libraries, also involved adding “controlled vocabulary” terms to each book’s description in the database, thereby allowing anyone using VCU’s online catalog to discover books by browsing for attributes such as “marbled edges,” “presentation inscriptions,” “gold tooled bindings,” “diced leather bindings” and much more. “It really opens up what you can search for, in terms of the material aspects of the books,” he said. Neuhauser has also updated the largest database of pre-1800 English language imprints, the English Short Title Catalog, to reflect VCU’s holdings, meaning that someone searching the ESTC from anywhere in the world will be able to locate a copy of Johnson’s Dictionary at VCU. Many of the books in VCU Libraries’ pre-1800 collection are medical books in the collection of the Tompkins-McCaw Library for the Health Sciences. Jodi Koste, university archivist and head of Tompkins-McCaw Library Special Collections and Archives, said Neuhauser’s efforts have improved the discoverability of the collection’s old and rare medical texts. Elizabeth McDaniel, special collections catalog librarian, oversaw Neuhauser’s assistantship. Neuhauser, she said, has been a great colleague and has made a wonderful contribution to VCU Libraries’ catalog. Neuhauser has been cataloging VCU Libraries’ trove of books published before 1800, including several early English dictionaries by Samuel Johnson. As he cataloged the books, Neuhauser came across a number of books with marginalia — handwritten notes scribbled in the margins. “In one, a book about treating horses called ‘The Farrier’s New Guide,’ , whoever owned it filled it with all these notes saying things like ‘This is nonsense,’ and crossing out wrong information,” he said. Neuhauser’s concentrations on books and history can also be found in his research as an English graduate student. He is writing his master’s thesis on the development, writings and social organizations of 17th-century Cavalier poets, notoriously bawdy royalist poets. During the English Interregnum (1640-1660), “[the Cavaliers] protested the puritanical government by forming drinking clubs and writing really witty, funny, often inappropriate and sometimes experimental poetry,” he said. Neuhauser recently received a scholarship to attend the London Rare Books School at the University of London. As part of the scholarship, he will travel to London later this month to take a course, “The Book in Early Modern England,” on the production, distribution and consumption of books in the 16th and 17th centuries. 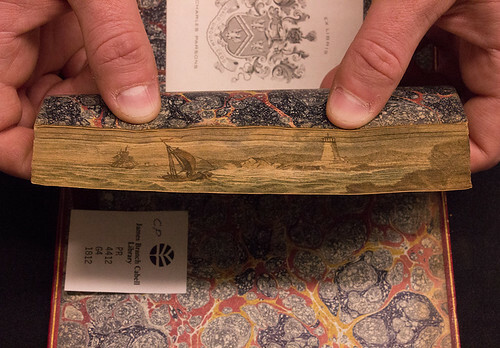 Want a look inside some of VCU Libraries' oldest and rarest books? Click the slideshow below or visit http://go.vcu.edu/oldbooks.